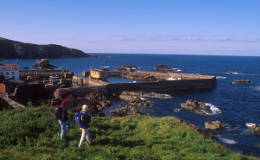 Enjoy a one-day private tour along the Scottish Borders. Discover the stunning beauty and history of the Scottish Borders and spend a magical day enjoying the finest views, monuments and food in the south of Scotland. If you like history, traditions and breathtaking views, Capital Cars has the perfect one-day tour for you, the Border Rover. After picking you up from your hotel in Edinburgh, we will head east along the coast to Tantallon Castle with its stunning views across the Forth Estuary. From there we will head south to the picturesque Glenkinchie Distillery for an optional tour and a taste of "The Water of Life". Your journey will carry on to Stately Floors Castle with its beautiful gardens before visiting Melrose for lunch and a chance to visit Melrose Abbey. Heading north we will stop at the majestic Scots View with its panoramic views of the Eildon Hills before heading on to the 15th century Roslin Chapel, made famous in the Da Vinci Code. Whether you are travelling on your own or taking your family or a group, our bespoke private tours will fit your needs with saloon cars or people carriers, depending on how many people are in your group.